Merchandise available! Awesome posters, books or model kits related to the LVT-4 Water Buffalo are available! Check the bottom of the page! 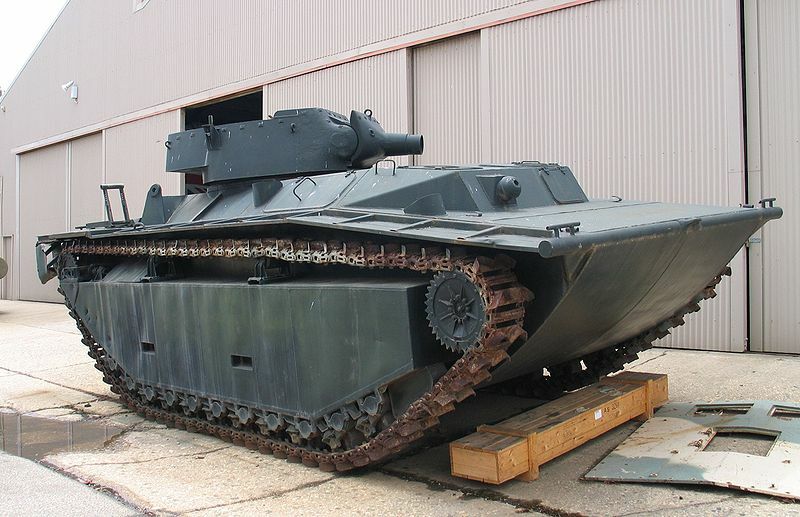 The fourth LVT was designed in 1943 and was based on the previous LVT-2. It was the first to feature a stern ramp for the unloading of personnel and cargo. 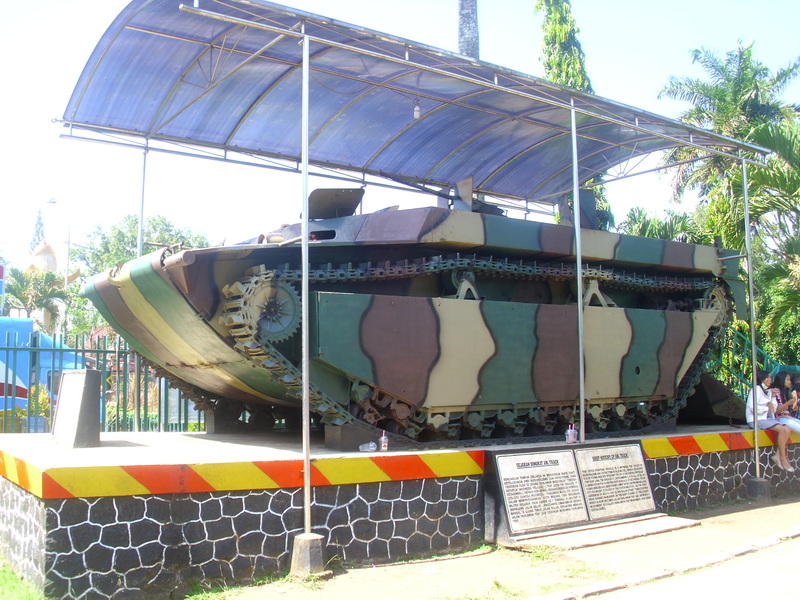 It was also the most produced of any LVTs during the war. The rear ramp alone was a remarkable step forward, essentially dictated by early battle reports over casualties during troop landings. The vehicle was completely remodeled around this feature, with the engine relocated from the rear to behind the driver’s cab. This allowed a larger cargo area and thus provided enough space to accommodate a full rear loading ramp, and up to 30 marines (compared to the LVT-2’s 16). This configuration provided better protection to landing forces and facilitated loading. Another particularity was the addition of Wash Vanes (honeycombed boxes above the tracks) that forced the water out, pushed by the grousers when in motion. The Continental W670-9A engine drove the front sprockets through a very short prop shaft, together with a controlled differential and final drive unit. The Torsilastic transmission used a 5 forward one 1 reverse spicer gearbox. The driver could see through two large bulletproof glass slits and access/exit through two hatches on top. It had 73 track links per side, with grousers, which propelled it both on land and on water. Track adjustment was provided by the moving the idler and sprocket. There were 11 independent bogie wheels and two return rollers. The armament consisted of 12.7 (0.5 in) and 7.62 mm (0.3 in) machine guns, with or without masks, on four side pintle mounts, manned by the squad, plus a ball-mounted 30 cal (7.62 mm) in the front cab, manned by the co-driver. In addition, appliqué armor could be attached, 0.5 inches (13 mm) on the front and 0.25 inches (6.4 mm) on the sides. However, when this was done, the payload was reduced by 3000 lbs (1,360 kg). More than 8300 LVT-4s were produced from December 1943 until the end of the war by the Food Machinery Corp at Lakeland, Florida, Riverside & San Jose, California, Graham-Paige Motor Corp. in Detroit, Michigan and St Louis Car Co. at St Louis, Missouri. 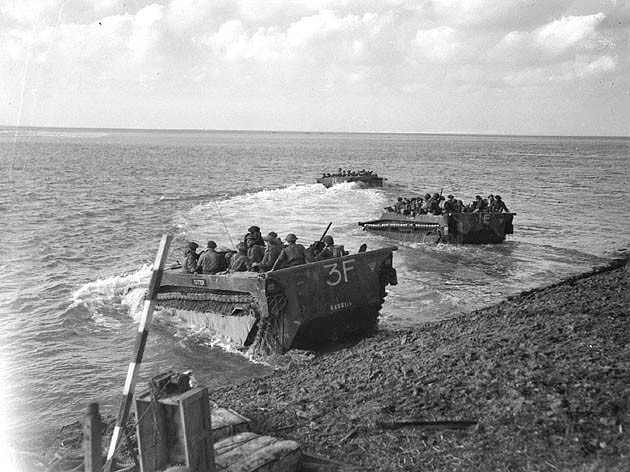 The LVT-4s were first used at Peleliu, along with LVT-2s. This operation showed the fruit of the designer’s efforts, leading to a well-improved machine, useful, well-protected and reliable. On the long run, the engine’s location facilitated its maintenance. But this relocation had a downfall, as the cooling system was apparently inadequate, which caused the engine to overheat. 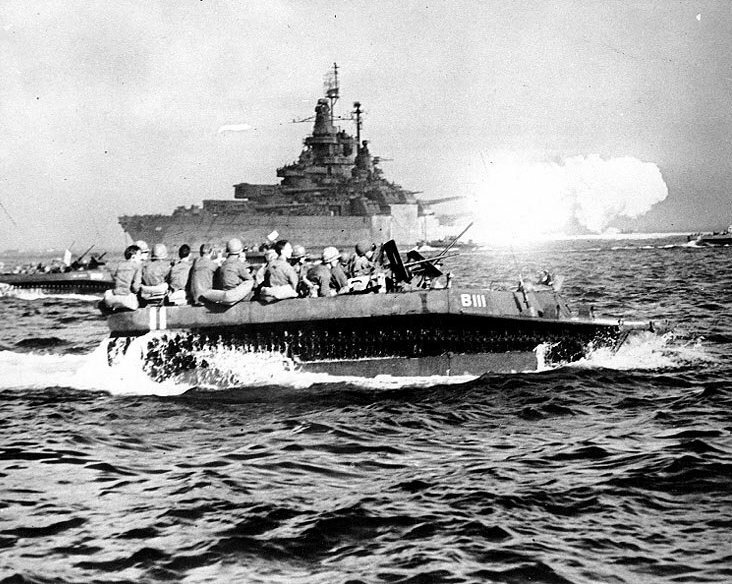 The 1st Marine Division fitted three LVT-4s with the new Navy Mk.I flamethrowers tested before the operation, with a fourth LVT providing supply. 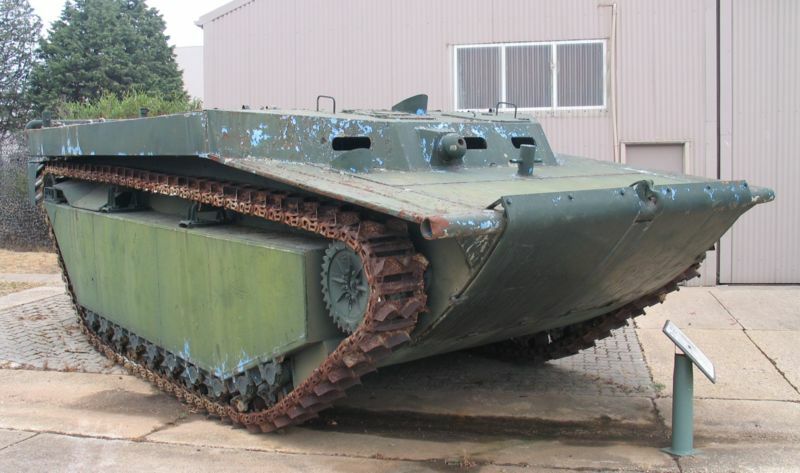 This unit was given to the 1st Amphibian Tractor Battalion. The Navy Mk.I flamethrower was modeled after the Canadian Ronson, and its range was 75 yards (68 m) with gasoline/oil mixture and up to 150 yards (137 m) with napalm bursting from 55 seconds up to 80 seconds. 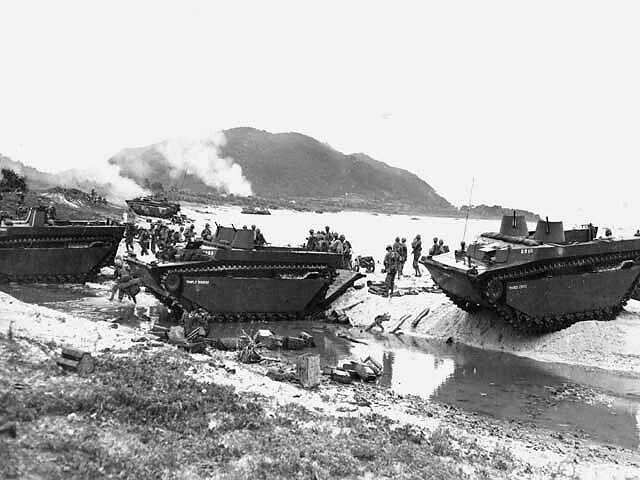 LVT-4s participated in the Saipan campaign (June 1944), Guam and Tinian (July 1944). 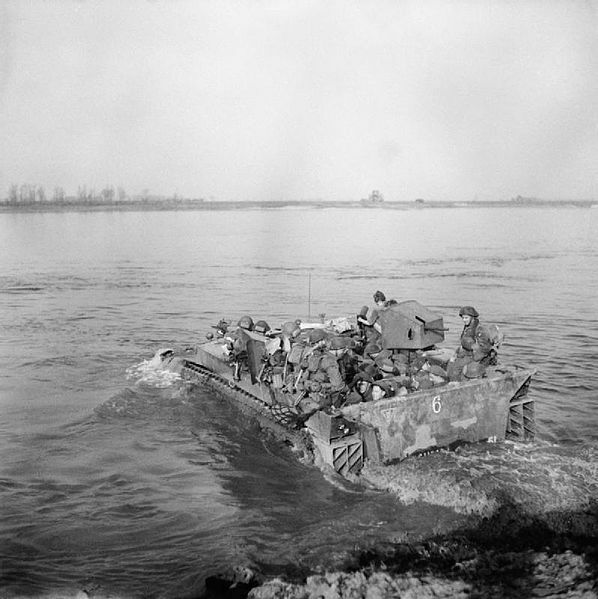 LVT-4s were also used by British and Canadian troops during the operations in the Netherlands (like the Battle of the Scheldt in October 1944) and by Allied forces when crossing the Rhine in March 1945 (Operation Plunder). Others were provided, through Lend-Lease, to the Red Army, that used these vehicles when assaulting the well-defended Oder and Danube west banks. After the war, French vehicles took part in the Suez crisis intervention and Indochina war, and USMC vehicles were used at Inchon in Korea. A regular US Army LVT-4 in 1944. 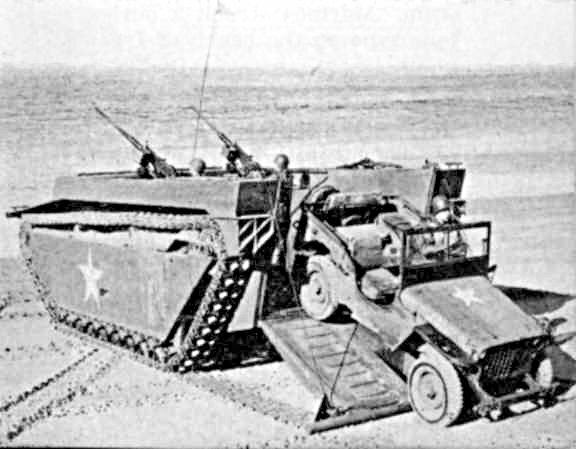 Early production US Marine Corps LVT-4 in 1944. 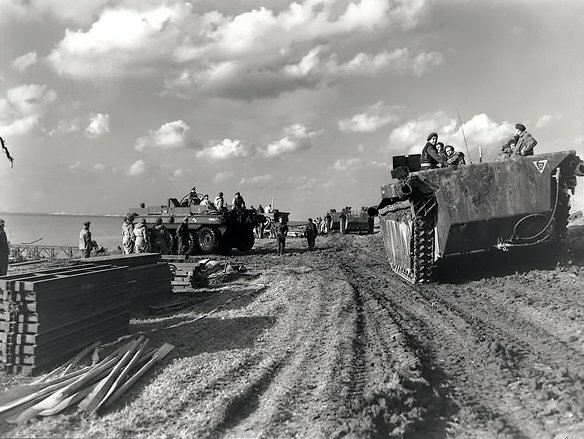 USMC LVT-4, Tinian, August 1944. Buffalo IV of the 79th Armoured Division, Rhineland, March 1945. 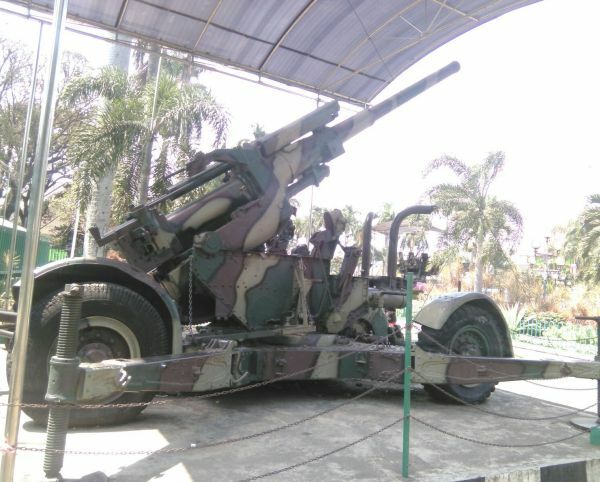 Notice the 20 mm (0.79 in) Polsten autocannon. Buffalo IV Sheffield of the Royal Dragoons, Rhineland, 79th Armoured Division, March 1945. 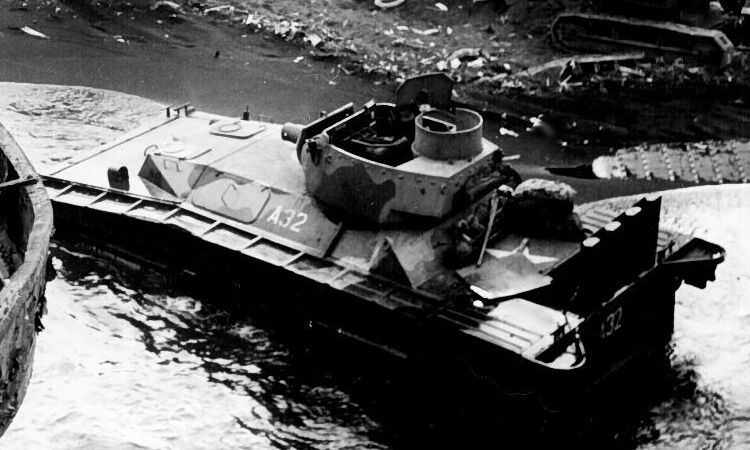 LVT-4 in the Philippines, US Army, early 1945. 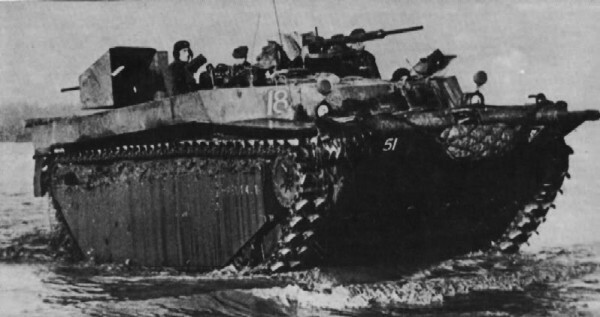 Late up-armored LVT-4 in 1944. Preserved LVT-4 at the USMC American Wartime Museum, nowadays. LVT-4 of the USMC with the early up-armored cab, 3rd USMC Tractor Marine Battalion, Iwo Jima, 1945. 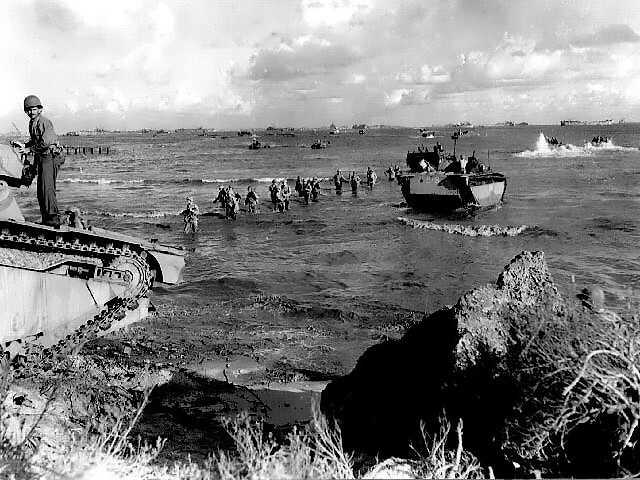 LVT-4 of the 10th USMC Amphibious Tractor Battalion, Yellow Beach, Iwo Jima, February 1945. Early up-armoured cab VT-4, 8th USMC Amphibious Tractor Battalion, 1st US Marine Division, Okinawa, summer 1945. Lend-Lease LVT-4, Red Army, the crossing of the Oder, 1945. French LVT-4 of Force H, Port Said, Egypt, Suez crisis, 1956. 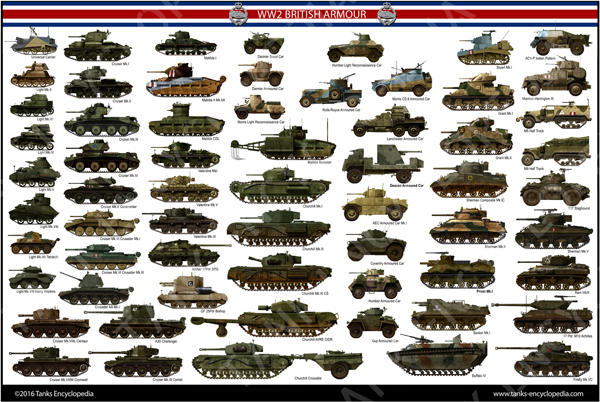 Poster of British armor of the Second World War, including Commonwealth and Lend-Lease Vehicles. Churchils, Cromwells, Matildas and many iconic or little known British vehicles are featured! I am currently working on a modification for a game called Hearts of Iron 4, by looking it up you can see what I’m taking about. It’s a computer game that simulates the period between 1936 -1945 and currently they allow people to “mod” the game to be released and played by owners of the base game (the base game is hearts of iron 4). Only the base game is sold for money, mods are not allowed to be sold so, I was wondering if you have any graphics as such that are not copywritten or have free grahics available to the public. Thanks again for you time, I’ll be looking forwards to a reply. As a rule, the images displayed on the website and on its dependencies like Pinterest or Flickr (HD illustrations) are available for sharing and re-using under “fair use” conditions (non-commercial use). A mod is indeed non-commercial (i participated in several mods myself), so you have the green light as far i am concerned, with a credit if possible. For the illustrations with copyrights however they will stay as is, until i came back to reconstruct the illustrations and release these a second time, that’s an ongoing long term process. 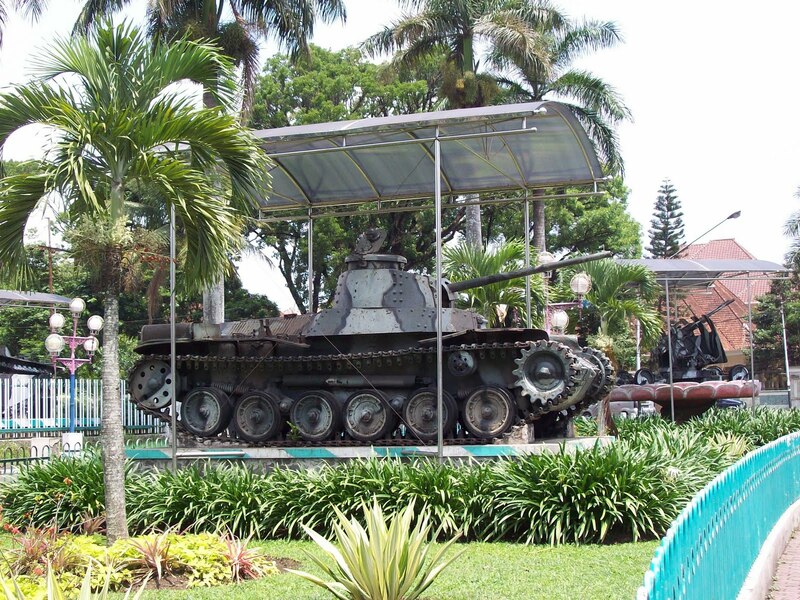 Hi, I found a photo while browsing about war museum in my country. It was Dutch LVT from War of Independence era in my country. What LVT variant is that? On the monument plaque it’s written as ‘AM. TRACK’ but it has no turret so it’s not the LVT(A)1. The body is looks like LVT-4 but its return rollers are different (?). The camouflage looks like WW1 paint scheme, I don’t know if it was actual Dutch military camouflage or a repaint. By the way the spelling error and wrong name of past military hardwares (including some of infantry weapons) is quite common here. It’s because in the past they named the hardwares after its nicknames or what they heard from other people (most of them didn’t know the actual spelling of the original name). For example, once (and sometimes now) the Bren gun was written as ‘Brend’ or ‘Brand’.